This just in: if you cut, scrape, burn, flex, and smash your iPad Pro there is a chance that it might break. This isn't what AppleInsider usually means by breaking news, but evidently, one YouTuber does. 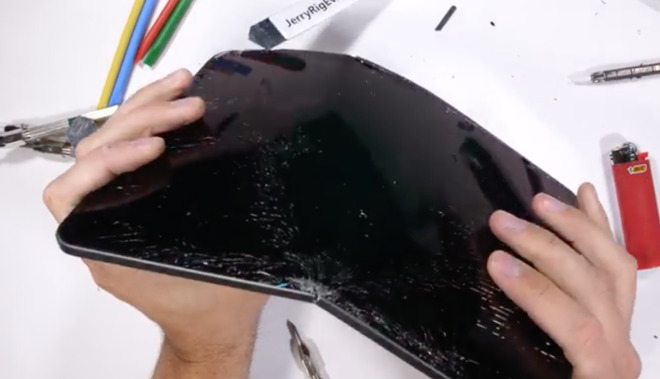 YouTuberJerryRigEverything has smashed his iPad Pro so you don't have to. Only, you didn't have to. 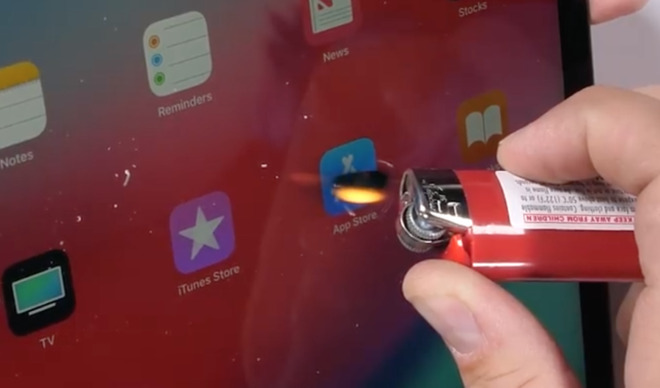 Still, thanks to this brave, brave man, it is now official —if you cut, scrape, burn, bend and smash your iPad Pro, it is conceivable that you might damage it. You have been warned. We had thought that AppleInsider testing was thorough but this does leave us behind —and we're fine with that. There's exhaustive testing and there is ridiculous, pointless testing with no scientific method or means behind it. For instance, at each single step in the process, this guy maintains that he's really checking out whether Apple is telling the truth about the materials in the iPad Pro. When Apple tells us the front is made of glass, we're fine with just believing them. You could call that being too trusting, you could call it naive, but we prefer to think of it as dialing back the observations of the obvious. Yes, of course Apple could be lying when it says the front is made of glass but on the one hand, there are bigger things it could lie about. And on the other, if it isn't glass then it's doing a very good job of letting us see through it. That's not enough for Jerry, though. He has to know for sure and, moreover, he appears to have to tell us for sure. So he scrapes at the glass —alleged glass —with a series of increasingly hard tools until he's proved that the glass scratches like glass and so is probably glass. It turns out that metal is also metal, that bits of plastic needed to let WiFi and cellular signals through are bits of plastic. And the holes for the microphone and speakers are most definitely holes. Is anybody surprised that a thin plate of metal bends more readily than a thicker one? Jerry does make the point that if you have a hole in a piece of metal, that metal is weakened. If you weaken metal, you can bend it. And now you can see where all of this is going. Jerry wants another Bendgate. This is the name given to the fact back in 2014 that the iPhone 6 Plus could be bent if you really wanted to. 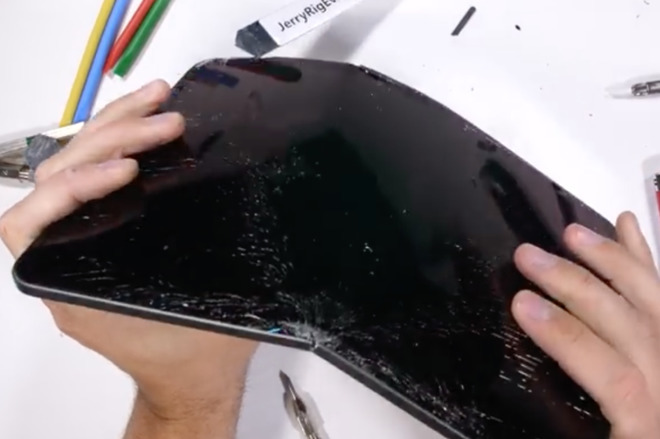 Maybe Apple will put their hands up to this one, too, and confess that if you try to bend a thin piece of aluminum that it will bend, and announce that smashed screens are the result of people smashing their screens. Maybe they'll again open up their testing facilities to the media so that we can see for ourselves that, well, Apple tests things a bit. Apple tests them so JerryRigEverything doesn't have to but he has nonetheless single-mindedly pursued this again, and has garnered a rising number of views, again. He has pursued the goal of getting people to talk about this vital issue of how many views he's got. We've clearly fallen for that last bit but you can resist. Regardless if you click on his Subscribe button or not, you probably shouldn't go out of your way to break your iPad. If you must hold a lighter up to the glass, if you must scratch drawings into the back and then try out your collection of glass-scraping tools on something, well, everybody needs a hobby. There just might be cheaper surfaces than an iPad you can try first. Treat your iPad like you should treat a $350 or $1000 thin slab of glass and metal and you'll be fine.